Today’s Sunday brunch offers more random thoughts and info on children’s books, including some that look back in time to the JFK assassination and the Apollo moon landings -- and even way, way back to the medieval era. This blog entry also serves up blueberry cheesecake, breakfast serials, and breakfast cereals. I understand that desire. It’s the sign of a good book. I thought about that wish for “one page more” a couple weeks ago when I found a first edition of Clare Turlay Newberry’s 1941 Caldecott Honor Book APRIL’S KITTENS for sale on the internet. It only cost $10 and, desperate to earn some extra money in these rough economic times, I purchased the book with plans to resell it for a small profit. And I knew the profit would indeed be small since the book didn’t include a dustjacket. However, when the book arrived it turned out to be grubbier and more worn than anticipated. Even worse, the original owner (a girl named Patricia Wetherby Heyer who, according to the inscription, had received this book “with much love from Grandma” for Christmas 1940) was also of the “one page more” philosophy. Okay, it’s a cute drawing, but now I’m never going to be able to sell this book for a profit. Ah well, one of these days I’m going to find an old scribbled-in book signed by “Little Maury Sendak” or “Christopher V. A., age 5” or “Davie Wiesner” and may finally get rich. WHERE WERE YOU ON NOVEMBER 22, 1963? Yesterday was the forty-fifth anniversary of the assassination of President John F. Kennedy. For many years, this event was one of those historical touchstones that united every American with “Where were you and what were you doing when you heard?” commonality. Everyone remembered, everyone had a story. It’s shocking to realize how much time has passed since November 22, 1963 -- and to realize there are now more Americans who DON’T remember this event than those who do. Generations have passed. The Kennedy assassination has been supplanted by other shared “where were you?” experiences: September 11...the Apollo moon landing...the Challenger explosion...even the death of Elvis. A couple weeks ago, on Veteran’s Day, I heard that there are less than ten WWI vets left in the entire world. Within a couple years they’ll all be gone. Now I hear that over 1200 WWII veterans die every single day. Someday they too will be gone. And I guess it won’t be too many years till all of us who remember November 22, 1963 are gone as well. I was pretty young when it happened -- barely five years old. But here's my memory: the night before John F. Kennedy died I saw a ghost. On the evening of November 21, 1963, our family was headed for a funeral in southern Indiana. We left late in the evening -- night-driving was faster, and we needed to be in Indiana by midmorning. My parents settled us in the backseat of the car, half-asleep, and then hit the road. It was dark, it was rainy, my mother had a toothache. And before we’d gone five miles, she remembered that she’d carried my sleeping little brother out to the car in just his socks and left his shoes at home. My father turned the car around, drove back home, and we waited outside in our big, used two-tone blue Ford while my mother ran inside for the shoes. And that’s when I saw, on our dark porch in the middle of our very dark block, a little boy dressed all in white knocking on our front door. Halloween was just past and, in my mind, he was a leftover trick-or-treater wandering alone after midnight. I pointed him out to my father, who of course couldn’t see any kid on the porch. But I could see him and even now, if I close my eyes, I can picture that boy-in-white standing on his tiptoes, reaching up to tap on the door. After a while he got tired and sat down on the edge of the porch step with his cheek resting on his fist, then got up to knock on the door again. When my mother got back in the car, I asked why she hadn’t gone to the door when the little boy knocked. Of course she had no idea what I was talking about either. My parents questioned me for a couple minutes, then decided I’d been “dreaming” and again hit the road for Indiana. (Personally, if I was about to set off for a long, dark road trip and someone said they’d just seen a boy-in-white knocking on my front door, I would have canceled the trip!) But our ride to Indiana turned out to be quite uneventful. The next afternoon we were all gathered in the dining room of my uncle’s house when a teenaged cousin came running into the house saying he’d just been at the little store across the street and heard that the president had been shot. I don’t remember much else about the event, except returning home that weekend and being disappointed that none of my favorite cartoons were on TV because of the constant news coverage. So after lunch, I gathered the armful of red material and went down to the auditorium to finish Danforth’s cloak. Someone had been making last minute changes with the lights, leaving the stage curtains open. The first act set stood waiting, with the patchwork quilt my great-grandmother had made, Mollie’s spool bed, the chest-on-chest Paul had laboriously stripped and finished, the bull’s-eye windowpanes that I had painted. It looked like a real home. For the rest of my life, I thought, I’ll remember sitting here this afternoon, alone yet not alone, sewing on Danforth’s cloak. I looked at the clock at that moment; I did not know why. The hands stood at exactly twenty to three. And all at once I realized I was no more alone. Gramps had come in. He was standing in the back, an odd cracked look on his old face. It was a look that made me involuntarily start to rise, made my lips begin to frame a question. Before I could speak it, he was answering, his voice echoing tinnily through the stillness. At twenty to three, on the afternoon John Fitzgerald Kennedy died, I sat in the Oakdale High School auditorium, sewing a costume for The Crucible, and the red fabric, fallen from my lap, lay on the stone floor like a pool of blood. Wow. How much do I love THE CRUCIBLE YEAR? So much that, as a soon as I read this book at the library, I rushed out and ordered a copy at the bookstore for myself. And I’ve read it so many times over the years that, when the pages began to pull loose of the binding, I tracked down a SECOND copy of this hard-to-find volume. The only other title for young people with a Kennedy assassination theme that I know about is PAGAENT by Kathryn Lasky, a 1986 novel about a Jewish girl attending an exclusive Christian school; the story follows the life of the protagonist across several years which, not coincidentally, match the years of the Kennedy presidency from election to assassination. I haven’t read PAGEANT in ages, but remember it as exceptionally good. I think I need to track it down again! Surely there must be more fictional stories the describe the events of November 22, 1963 from a young person’s perspective. Do you know of any? Do you have a story of your own? Last Sunday I wrote about the Hans Chrsitian Andersen Prize, an international award given to a children’s author for his or her complete body of work. Presented every two years since 1956, only five American writers have won: Meindert DeJong, Scott O’Dell, Paula Fox, Virginia Hamilton, and Katherine Paterson. Shockingly, only one American illustrator has ever won -- Maurice Sendak, way back in 1970! Do you know what a BLAD is? But in terms of children’s book publishing, BLAD is an acronym for “Basic Layout And Design.” It’s a truncated version of a soon-to-be published book containing the cover art and some sample pages. Recently, a blad (friend) who works in publishing sent me a BLAD (Basic Layout And Design) of a forthcoming title, MISSION CONTROL, THIS IS APOLLO : THE STORY OF THE FIRST VOYAGES TO THE MOON, written by Andrew Chaiken and illustrated by Alan Bean. If the second name sounds familiar, it’s because Bean was the fourth man to walk on the moon! ...So now we’ll have a children’s book illustrated by someone who walked on the moon to accompany the children’s book written by someone who walked on the moon: Buzz Aldrin’s 2005 title REACHING FOR THE MOON. The other day I came across a volume by Gerald Morris and was reminded of what fun, readable books he’s written over the past ten years. I remember seeing his first title, THE SQUIRE’S TALE at the bookstore and laughing at the amusing cover illustration, never thinking that over the next decade he’d write seven more novels inspired by the legends of King Arthur, each one stronger than the last in plotting, characterization, and theme. As Houghton Mifflin books, they must have the publication date on the title page to be true first editions. If you don’t see a date on the title page, you’ve got a later printing. The banquet was held in Dallas the room was huge and elegant. Eighteen hundred people were there, and the people who were to sit at the head table formed a sort of procession through the tables. Leading us were two teenaged boys in kind of King Arthur page boy suits and they were bearing large banners. The boy preceding me had a banner on which there was a swan made of real swan feathers (hand sewn, one by one) and it was gorgeous. I almost felt like I was back in medieval times. Then just before we were to enter, the boy turned to me and said, “I could just kill my mom for making me do this.” Instantly I was back in the twentieth century. Now, I have had many pieces of blueberry cheesecake in the intervening years, but I tell you I have never had one that would have been as good as the one I would have had if I could have delivered by whole speech at the same rapid pace the I delivered the last few lines. I’m currently reading, and enjoying, THE GHOSTS OF KERFOL by Deborah Noyes, a collection of inter-related short stories inspired by Edith Wharton’s spooky tale for adult readers “Kerfol.” A few years ago, Gordon Korman dipped into another adult literary classic, F. Scott Fitzgerad’s THE GREAT GATSBY, to write an intriguing teenage novel JAKE, REINVENTED. In addition to these adult works that inspired books for young readers, there have also been cases of kids’ books inspiring adult novels -- most notably Geraldine Brooks’s Pulitizer Prize winning MARCH, in which she re-imagines the Civil War experiences of "March," the father of the LITTLE WOMEN clan. And sometimes children’s books can even inspire other children’s books. Neil Gaiman’s current popular and critical hit, THE GRAVEYARD BOOK draws from Rudyard Kipling’s THE JUNGLE BOOK. Gaiman’s young son used to ride his tricycle at a local cemetery, which gave the author the idea of a little boy raised by ghosts in a graveyard, rather than the reared by wild animals in a jungle. Speaking of THE JUNGLE BOOK, singer Pete Wentz and singer/lip-syncher Ashelee Simpson had their baby this past week and named him Bronx Mowgli. I’d make a crack about crazy celebrities naming the baby after the Disney movie and knowing nothing about the Kipling volume, but it turns out that Wentz is quite a children’s book fan whose hit recording “Under the Cork Tree” drew its name from the 1936 classic STORY OF FERDINAND by Munro Leaf and Robert Lawson. Lately, many people have asked me about the fate of the American newspaper in an era when circulation, advertising and staff size are all sharply down. I've told them what editors have told me: The next 18 to 24 months may well see the first major U.S. city without a daily paper. It's a time frame that makes people swallow hard. ''That soon?'' they say. And I say yes. The end could begin in less than two years. Now I'm wondering if it's going to take that long. Gulp. That would be a sad development -- though not surprising in this era of online news. Well, I hope my local newspaper keeps going...and keeps publishing the “Breakfast Serials” for kids -- serialized novels printed, chapter by chapter, on a weekly basis. Conceived by Avi in 1996, the series has introduced kids to some good stories -- and, no doubt, gotten many in the habit of picking up the newspaper. I’m not quite sure why my paper is currently doing a repeat of Liza Ketchum’s ORPHAN JOURNEY HOME, with a serialization of Avi’s 1984 book THE FIGHTING GROUND next (isn’t the point of the project to have kids looking forward to a new chapter each week, rather than being able to borrow the book from the library before the serial has finished its run?) The good news is that it appears Newbery winner Linda Sue Park is waiting in the wings with a new original serial novel called “A Long Walk to Water,” which concerns the plight of the Sudanese “Lost Boys.” Should be worth reading! I called the customer comment line listed on the package and asked if anyone had proofread their cereal. 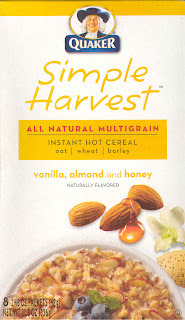 A week later they sent me a coupon for a free box of Simple Harvest cereal. Who said you can’t make money reading? Ah how it brings back memories. Thanks for another lovely brunch! I really enjoy them.